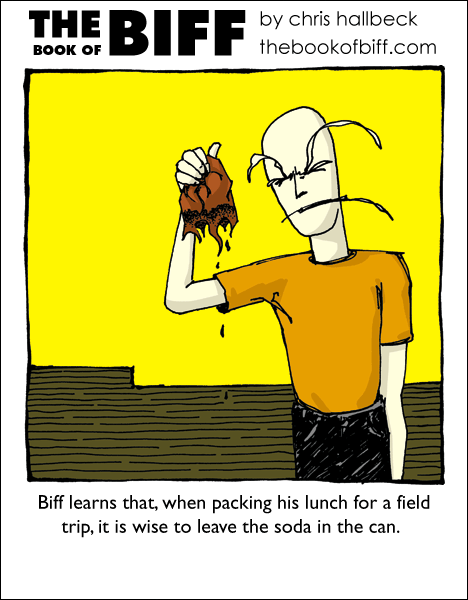 I wonder if Biff is still in school but he apparently lives in a house (hopefuly) alone. Collage maby? Maybe it’s a work field trip? You’ve never brought a bag lunch to work? Erm, field trip? Is he one of those grumpy old men that go to normal school, and don’t exist in real life? It’s just foreshortening his eyebrows are really the same size. And why doesn’t he use a lunch box? It got rusty from the soda. However, it is hard when you fill up a thermos and it leaks. Just as bad! …yeah, I’m pretty sure that one’s a no-brainer. Soooo… Biff found his brain yet? i bagged soda successfully one time, it was a plastic bag with no holes.